On this page you can find details about the role of our National Field Officer as well as how to contact him, technical information and downloads. The Society structure includes an elected Field officer, appointed to provide guidance to members about the breed standard, and also to continue to review the breed standard and future direction of the breed. The Field officer is a member of the Society Council and is always an experienced breeder and judge. They travel around the regions, attending shows, sales and regional events. They also give advice to members of the Society on their flocks, their breeding policy and any aspect of flock management. 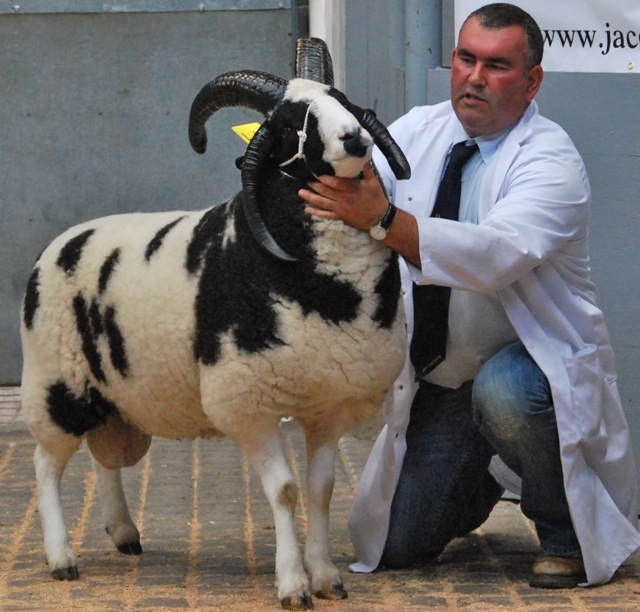 They are also responsible for ensuring that judges appointed by the society are undertaking their duties properly and professionally.The Field Officer also provides technical information to the Society on various aspects of breeding and keeping sheep and the current advice can be accessed using the links at the end of this page. This is a new trophy to be awarded to the ' Young Person of the Year' and to be presented at the Society AGM. Nominations for this award are invited from any Society member and the form should be downloaded from this website. It will be awarded to the young person under the age of 25 who has given help in any way to improve the running of the Society. It is particularly emphasised that success in the show ring does not merit a nomination. The Society has had a watching brief on Tay-Sachs in UK Jacobs since it was brought to our attention in 2011. Tay-Sachs is a genetic disorder like cystic fibrosis or haemophilia that is carried in a very small proportion of the population. It is found in humans, dogs, cats, flamingos and Jacob sheep. Limited information has been available until scientific papers on Tay-Sachs in UK Jacobs were published in October 2013 and February 2014. Following the March 2014 JSS Council meeting, Council Members formed a strategy and communications plan based on protecting the welfare of Jacob sheep and also the interests of our members. Working with colleagues in the veterinary community, researchers at Cambridge University and DEFRA Animal Health, and with the guidance and determination of Chris Lewis (a noted sheep expert and retired vet), the JSS has funded the creation of a UK test to identify Tay-Sachs in Jacobs. The test is voluntary and is now available to members who wish to test their stock. Members should click on the home page of this website https://site.jacobsheepsociety.com then click on the 'search for members or sheep' button which will take members to their own log in page for registrations. After logging on, Click 'Manage my flock' and it will take you to the Tay-Sachs DNA test option. Carefully select the registered sheep from your flock list to sample, add them to your basket and pay through the check out. Grassroots will be able to help with any dispatch or returns queries through the normal contact routes. Results are anonymous and confidential between members and their vets and members will pay their vets for the service. We do not know how widespread Tay-Sachs is. Carriers of the genetic disorder show no symptoms but a small number of the progeny from two carriers may develop the disorder which is fatal. Any unexplained deaths in 6-8 month old lambs should be checked for Tay-Sachs. The JSS Council has a continuing strategy to monitor Tay-Sachs. At present, we would encourage members to at least get their rams tested as by doing so the potential spread of Tay-Sachs can be restricted. Please do not contact the Lab direct. The Field Officer can provide help with interpretation of results and with breeding advice. The following technical information is provided and updated by the Field Officer for use by members.